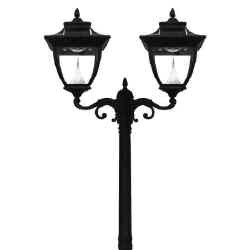 The Gama Sonic Pagoda solar outdoor light fixture model GS-104F is the perfect energy-saving and money-saving replacement for post-mounted electric or gas-powered outdoor lighting. The Gama Sonic Pagoda solar outdoor light fixture model GS-104F is the perfect energy-saving and money-saving replacement for post-mounted electric or gas-powered outdoor lighting. This rust-resistant cast-aluminum solar lantern with a powder-coated black finish and real glass panes were inspired by the architecture of Eastern Asia. It fits any existing three-inch-diameter lamp post with no electrical wiring needed. Just install it, and let the sun do the rest. The Pagoda’s internal Lithium Ion battery pack charges when sunlight hits the fixture’s integrated solar panels. At dusk, 13 bright-white LEDs will turn on automatically and in high-brightness mode will shine at 180 lumens for up to eight hours on a full solar charge. For longer run times, switch the brightness mode to low. 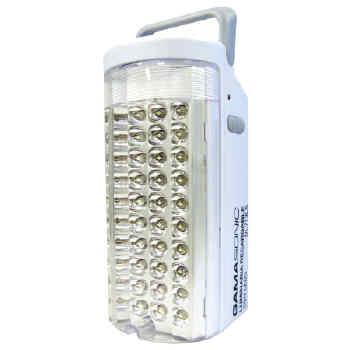 In either mode, Gama Sonic’s patented cone reflector enhances the light output and glow. Beyond providing a superior combination of light brightness and duration, Gama Sonic solar light fixtures are known for their physical durability. The Pagoda’s four monocrystalline silicon solar panels are protected by weather-resistant, cleanable tempered glass that helps ensure long-lasting reliability. The light’s replaceable plugged battery pack is good for about 1,000 charges. Recharging speed varies based on weather conditions, but generally, it takes about six hours of sunlight on the solar panels to achieve a full solar charge of the battery pack after it’s been completely run down.For any unexpected issues, Gama Sonic support at our Atlanta headquarters is here to help.